ColourLab Ltd, one of the South of England’s leading sign suppliers asked Hampshire Mezzanine Floors to assist them in moving premises. The new unit in Farnborough required an extension to the mezzanine floor to provide additional storage space and to help form a new printing area. HMF supplied and fitted a mezzanine floor, including one hour fire protection which was comprised of a 600 × 600 white suspended ceiling and one hour decorative white column cases. 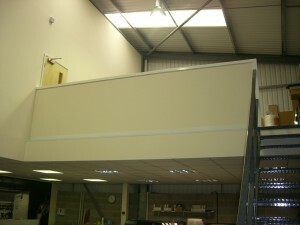 Hampshire Mezzanine also installed a full height jumbo stud wall with a set of double timber veneer doors to allow access to the new printing area. All the works were decorated to match the existing areas and an additional feature of the job was that the hand railing on the mezzanine floor perimeter was boxed in to form a low partition wall and finished with a timber top capped hand rail. Hampshire’s leading main contractor Hampshire Mezzanine Floors also installed new recessed modular lighting with 1 hour firefly canopy’s fitted to achieve fire protection. 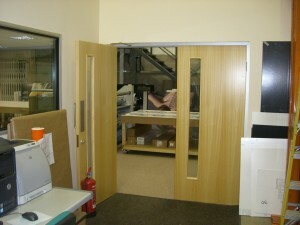 HMF also installed a new half hour fire existing single door on the first floor to provide ColourLab with access from the existing offices to the new work and storage areas. ColourLab Ltd now have a premises that can meet not only their current requirements but also accommodate for future plans of growth. The project, which was completed in July 2013 was completed over a three week period and was finished on schedule.